De Kesel was born in 1947 in Ghent. He entered the seminary in 1965, studied philosophy and theology at the seminary of Saint-Paul in Ghent and received his degree in Philosophy and Letters at the Catholic University of Leuven. From 1968 until 1972 he studied theology in Rome at the Pontifical Gregorian University, he gained first his license and then in 1977 his doctorate. He was ordained a priest for the Diocese of Ghent on 26 August 1972. While in Ghent he held the following positions: Professor of Religion at the College of Bishops Eeklo (1974–1980), Professor of Religion, Philosophical Anthropology and Contemporary Thought at the School of Social Gent (1977–1980), professor of fundamental theology and of dogmatic theology at the seminary of Ghent (1980–1996) and at the same time, Professor of Theology Higher Institute of Religious Sciences in Ghent, where he was also Dean, professor of Christology at the Catholic University of Louvain (1989–1992), responsible for the formation of pastoral workers in Ghent (1983–2002), episcopal vicar for theological training and pastoral in the diocese of Ghent (1992–2002). Pope John Paul II appointed him Titular Bishop of Bulna and Auxiliary of Mechelen-Brussel on 20 March 2002. He was ordained a Bishop on 26 May and has been appointed as Vicar General for the Vicariate of Brussels. In the bishops' conference he has been responsible for the inter-diocesan Commission for Pastoral Liturgy (Flemish and French) and a delegate to the Commission of the Bishops' Conferences of the European Community ( COMECE ). He was appointed as bishop of Bruges after the early resignation of the previous bishop, Roger Vangheluwe and installed on 10 July 2010. 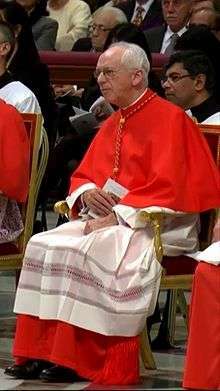 On September 2010 De Kesel said: "I think the Church must ask itself the question of whether it is appropriate to keep the mandatory character of celibacy. We could say that there are celibate priests, but that people for whom celibacy is humanly impossible should also have the chance of becoming priests." On 6 November 2015 Pope Francis named De Kesel to succeed André-Joseph Léonard as Archbishop of Mechelen-Brussels and Primate of Belgium. Unlike his predecessor, he is seen as a theological liberal, being a supporter of Cardinal Walter Kasper's proposal of communion to the divorced and remarried Catholic couples. 1 2 "RINUNCE E NOMINE". press.catholica.va. 25 June 2010. Retrieved 2 November 2010. ↑ "Belgian Monarchs Attend Mass in Mechelen". Royal Hats. ↑ "Pope announces 17 new Cardinals in consistory". Wikimedia Commons has media related to Jozef De Kesel.